The flag flown by the anti-establishment forces at the Battle of Bunker Hill, the start of the American revolution. I too, appeal to Heaven, and to you to hear me out by reading this. (Thur. 3/15) Throwing mud is something that politicians and their allies have done for a long time. Conservatives have been on the receiving end of this sort of smear for a long time. And we all know it. That’s why President Trump’s refrain from the election campaign through current day rallies about the “Fake Media” get such a reaction from his conservative supporters. The fact that I am now on the receiving end of a smear campaign designed to destroy my ability to influence public policy and to end my volunteer career as a Republican Party State and local Committee member, is actually nothing new. This newest post is my attempt to rebut and refute some of the lies being circulated about me in advance of the “star chamber proceeding” on March 24 in Richmond, VA. Sure, it isn’t secret. But, I said this is a combination of a lynching – hardly a secretive affair – and a rigged “star chamber” proceeding. Those sitting in judgement of me, led by VA GOP state chairman John Whitbeck, have already in advance announce the verdict against me without ever having heard anything from me. Now I am not as naive as some think. Even some of my friends have asked me whether I realize that the forces which are lined up against me are very powerful, and they express worry that by my struggling and “resisting” (is that a word only for left-wing, anti-Trump activists?) is futile. And my “resisting” these lies about me, will only make it worse as the continue to attack me on the way to a June 24 meeting in Richmond, VA of the State Central Committee. I will in this post, give you a point-by-point rebuttal of some of the lies about me. If someone has signed on to the “get Fredy Burgos” lynch mob, then they are a liberal Republican, or they are a liberal Democrat, period. By definition, anyone who is out to remove me for championing conservative, pro-values voters issues, is a liberal or even a leftist. If they are a moderate Republican by their definition, fine – but by the definition of those who resist their control of the Republican Party, they are liberals. And too, they are totally unfair in what they are spreading around about me. Now, lets look at what these liberals – who always get a sympathetic hearing from the news media – have said about me and what they are circulating about me. Chief among these liberal Republicans, is the GOP State Chairman for Virginia, John Whitbeck. He will sit in the chairman’s seat of a meeting where he and the majority in the room have already said I should be removed. John Whitbeck has said this in writing, on Facebook, on email, in the mail and on at least one radio talk show. Does it sound fair to you that Whitbeck, who has already judged me, said I am free to come to the meeting of the group I am a member, and make my case before they do what they have already said they have the votes to do – remove me from the top governing body of the GOP in Virginia? I’m not surprised that liberals can be so unfair and so unscrupulous. Perhaps most of my readers feel the same way. The surprise, is the number of State Central Committee members who we had been fooled into thinking were conservative, who have actually in writing (ie. with their signature) said I am guilty, before ever hearing anything from my side. So, here’s more about my side of it. Oh – the question has arison, am I wasting my time with this blog and these writings? You know any type of writing in English, my 2nd language, is not easy for me. I have posted short messages on Facebook before, but have never written longer articles (or essays) such as this. I thank those who have encouraged me to do this, have helped me in this work. This work is not just the result of the hours I have spent drafting these words but is also the result of those encouraging me, advising me, and making suggestions. I thank you, and I pray to God the Father that He find a way to extend my appreciation to you for extending to me this quiet help, training and support in this one-sided battle against me. And what then, is my motivation with all of this writing? 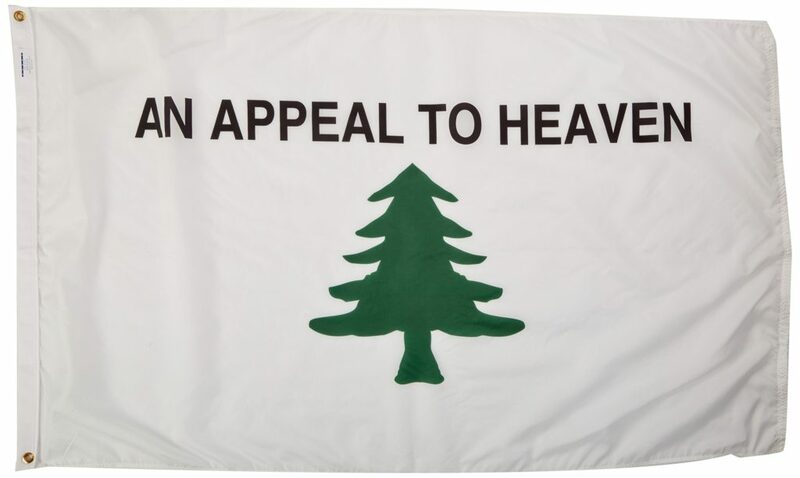 The flag flown at the Battle of Bunker Hill included an appeal for the success of their revolution against the established authority of King George, to Almighty God. I was inspired to learn this. I hope my writing this here inspires you too. America is the only country on earth, created around ideas. Those ideas are not illustrated anywhere better, than in this flag, which I borrow for my cause against the modern liberal establishment, including Republicans who also don’t like conservatives like me. Oh, they liked me well enough when I was their little pet, who they could trot out to show people how the GOP has spanish-speaking, Hispanic immigrants in their ranks. So why did they suddenly turn against me and announce that they will remove me from my GOP leadership on March 24? My strong expression of support for the issues of people of faith and of conservatism, have provoked the ire of the establishment liberals of the Virginia State Republican Party who now work to silence me and who use their office and the resources of the GOP to destroy me. The American revolutionaries also faced overwhelming odds. That is why I too, issue “an appeal to Heaven” as they did, to help me. The real resisters are those who support President Donald Trump and speak out for the issues which helped him win, and which can help Republicans win in the future. I appeal to heaven and to you, dear Reader, to learn about my situation, to pray for my success in speaking out and resisting the smearing of my name designed to suppress me. The post was a response to an interview that the English columnist Katie Hopkins had done. I even left the video interview as reference. She was describing illegal alien fake refugees that had been allowed in throughout Europe and in England. The behavior she described, are not the actions of normal human beings but the actions of monsters. That is what I was referring to. I never called “immigrants” feral but only to the monsters. Please note. This is exactly the sort of attack we see on conservatives all the time. If you speak about the rule of law and in favor of enforcing existing laws about illegal aliens, the liberals then complain you are attacking immigrants. President Trump is attacked by “fake media’ which exaggerates or mistates what he said, all the time. Conservatives know this is true. Liberals repeat the same lies about us over and over again. They are doing it to me. Shame on those who claim to be conservative, and believe them. 2. Placing a “Like” by someone else’s post calling Muslims “muzrats” and “moslem-parasites.”? This was a “Facebook conversation” someone was having concerning the upcoming presidential election in France at that the time. France was in trouble with the volume of fake refugees linked to terrorism coming into the country. The election was important to prevent individuals to enter France that would commit scenes like the one that was posted of radical Islamists who happen to be throwing homosexuals off a roof top, blindfolded, and with their hands tied behind their backs. You can watch and hear the sound of the bodies hitting the ground and see the bodies land on the concrete sidewalk like bags of human cement while others celebrate by chanting “Allahu Akbar”. I and most of my friends and most conservatives, feel these are the actions of monsters, not of normal human beings. I placed a “Like” at the criticism of those monsters. Typical of liberals who take us conservatives out of context, liberal Republicans then claim that I said I hate all Muslims, and circulate this lie about me endlessly to completely destroy my reputation and make even my friends fear for what would happen to them if they spoke out for me. This comment that I made comes from a conversation about a radical Islamist who slaughtered 49 people at a gay nightclub in Florida. Also a discussion about a video of radical Islamists placing people in locked cars and then with a grenade launcher shooting a grenade into the car. This comment was my reaction to those doing the crimes, not against all Muslims. My reaction was after seeing victims of the terrorists, being put into cages, which were then lowered slowly and agonizingly, into a swimming pool. The radicals then pull the cage out of the water a half hour later and you can see the bodies of their murdered victims, foaming at the mouth from the painful, drowning death at the hands of these monsters. The video also shows radical Islamists placing explosive necklaces around the necks of a chain gang then blowing their heads off. Is my calling this the acts of monsters, really getting me kicked off the GOP State Central Committee in Virginia? Is this not bizarre? I have also condemned the radical Islamists concerning the burning alive of a Jordanian air force pilot that was shot down and captured. The actions of these radical Islamists are actions of a “death cult” and people with a “retarded ideology”. These radicals are monsters not human beings. They are not a reflection of all Muslims but of Satan and those who follow a twisted and perverted version of the Muslim faith. If anyone believes these extremists are the actions of normal human beings and are men of God, there might be something wrong with them. And, that makes you wonder, what is wrong with people who attack me for saying and writing these words? What kind of fear – if that is all that this is – motivates people who claim to be our “leaders” but who worry so much that this criticism of terrorists might enable liberal-left Democrats to claim that all of us are hateful and all of us are anti-Muslim unless they go along with smearing and getting rid of Fredy Burgos? If they are that afraid, perhaps instead of going after me like this, they ought to be the ones who should resign from GOP leadership. I love my neighbors who happen to be Jordanian Muslims. They have lived across the street from me for 15 years. I have personally vouched for the oldest son, Omar, when he was in high school and he has also personally worked on my political campaign and supported me because he knows I love his family and would represent them well with the truth of the importance of God and traditional families. The truth is, nobody knows more than Muslims what fate is in store for them in the middle east as “apostates” who do not follow the teachings of these radical, hate-America monsters. And nobody knows more than them, what fate is in store for them, if that sort of “ideology” (if we can call what these monsters follow, such) ever comes to power in America. What many Americans don’t realize, is that they murder just as many Muslims who don’t follow their dictates as they murder Jews and Christians. Them’s the facts friends. *For burning alive video click HERE and start at the 16:30. 4. About Catholics: “Catholicism had and has problems. It has a sin problem of humanism/idols. Leave the Catholic Church and the Pope and go to the Cross…”. The conversation was that I had mentioned that we are ALL sinners and there are no exceptions in the eyes of God. Obviously, non-Christians might be unfamiliar with this. As also would be those who do not read the Book, I do. Perhaps the rest of my readers will have their memory refreshed by what follows. Our RPV Chairman, perhaps is unfamiliar with these passages. Perhaps he doesn’t agree with what it says, or has a totally different interpretation of what it means. John Whitbeck has – as do you, me and all of us – free will, given to him by God. He has the right to disagree with God or to interpret what I have posted here, differently from how his church and its priests teach. At the same time, I should have the right to believe in the word of God, and in how these passages are interpreted and taught by Christian ministers and priests of all denominations. I mentioned that most Christians won’t make it to heaven because the path is very narrow. Again, not my opinion but the word from this Book I read. Actually the direct words of our Savior, cited by eyewitness in The Book. We ask for forgiveness through Jesus Christ. The individual on Facebook who drew my reaction, was mentioning their own perception about the beliefs of different factions of the followers of Christ. I explained that we are all sinners from our birth (“original sin”) and by our actions. A good example that many Christians become idol worshipers is on Sundays. It is when a man runs 15 yards with a pig skin under his arm and many scream, yell, get excited, and wear all the symbols of a football team. They become happy, angry or sad throughout the work week when their team wins or loses on Sunday. Imagine if Christians were to get this excited worshiping God through Jesus Christ on Sundays. Oh, I realize that some might think you are nuts if the entire rest of the week, when people asked you why you are so happy, you were to say, I was really excited by what my priest or minister taught me after reading Scripture to us on Sunday. But isn’t it undeniably true, that we would have a better country, if more people were inspired by the Holy Spirit after they did listen better on Sundays and in fact if they did a regular reading of Scripture? Imagine how much better America would be, if more people did that? Yes, I will admit, this is something I advocate, knowing full well that some will disagree with me. I mentioned that all of us susceptible to idol worshipping to some degree whether it sports or something else. So yes, we are all sinners due to Adam and Eve and our actions. We simply have different individual problems as we get older. If you are going to expel from the GOP, all of the Protestants who think that Catholics “worship statues” you will most likely, have to get rid of the majority of the millions of evangelicals who voted for Donald Trump for President. If you’d done this in advance of voting in 2016, then Trump and the GOP would not have carried Pennsylvania, Michigan and several other battleground states. I do not condone this belief. But it is a fact that to many Protestants, it does APPEAR as if Catholics are worshiping the many statues they have in their church, of their various saints. Because of John Whitbeck’s false claim that I have been one of those critics, I learned from one of my Catholic supporters, more about this topic than I knew before. From what he wrote, he tends to the opinion that John Whitbeck as a Catholic, is either being disengeuous in what he wrote about me, or is actually ignorant about his own Catholic religion. I learned that Catholics venerate their Saints. The images are not there to worship or even to venerate but as an aid to help their focus in intercessory prayer. But, if a Protestant wants to believe that Catholics “worship” their statues, does John Whitbeck propose a new Inquisition where we can find them out and then have a Star Chamber proceeding to then subject them to the auto-da-fe and other ritual torture to “cleanse” them of their false beliefs and then purge them from the GOP? Are you guys kidding? I don’t think there is any humor in this absurd idea to put people “on trial” claiming you know what their religious beliefs are and punishing those who don’t agree with you. Yet, that is exactly what it appears they have planned for me on January 24. Shades of the Inquisition!! It just so happens that most of my friends that I love are Catholic and the man I have supported for county chairman is also a Catholic. The accusations of not loving my friends is outrageous. In fact, one of the strongest essays in support of me was written by a Catholic who has written nearly 100 detailed essays about faith and in fact who wrote a friendly critique of the effort to pillory me for my faith. For those outside of Fairfax County, let me clue you in on this: the other side has used the apparatus – including apparatchiks like the State and County GOP chairman, to help their favored, establishment-friendly candidate win office by launching a diversionary, Saul Alinsky attack using me. Nothing personal, I guess they would say, as they work to demonize and destroy me. 5. Attack on Jews by the John Jay quote was a premeditated attack on a man because he was Jewish. Those who follow me know that I have been using a statement, “Borders, Language and Culture Do Matter!” at the closing of most of my postings. It is a simple description of what it is to be a conservative patriot. I adopted it from a man that I admire for his courage, author, radio host, Dr. Michael Savage. This man that I admire, Dr. Savage, is a Jew. I have been advocating for our Judeo-Christian culture and how the open Christian values of our founding fathers are what created our country, and especially our ideas of religious pluralism and diversity, way before I ever heard of the individual they claim I was attacking. I have been advocating to “Make America Great Again” and “Make Fairfax Great Again” because the only way we can make America great is by taking back our own neighborhoods. The way we make America great again is by defending our founding and that it is what I have been advocating for. I came up with the local Fairfax slogan before the candidate I support officially declared his candidacy and before the fake victim existed as a candidate. Some of the people who have attacked me, have freely admitted that they wish they could take down President Trump too, who they also hate. They were called out for this in fact, by the liberal-left blog, Blue Virginia (right, Matt Ames?). On Sunday February 4, I posted a pro-Christian message which I often do on Sundays. I posted a quote by John Jay, the First Chief Justice of the United States, 1789-95. He was appointed by George Washington. Lets remember, even that can easily be taken out of context, to mean that we are “against” those who are either agnostics (ie. confused as to whether or not, there is a God) or who are Atheists (who both deny the existence of God and who for the most part, detest those who DO believe). Typical of liberals, they twisted around, the words of John Jay. I now better understand what some of my friends have warned me about with this quote, and how it could be taken out of context. I will always and why I have been standing up against a false accusation of being against a group of people that I love, the Jewish people. Never have I advocated to vote against anyone for their values but to vote for one’s own values. Simply promoting the RPV Creed is not a bad thing. I don’t think I have read anywhere, that those who persecute me, have ever advocated for that part of the Republican Creed in Virginia. It is false and low class to weasel out a negative message from advocating for Christ, country, and the Republican Creed. Here are the quotes. I did not say don’t vote against anyone. Most important, as I wrote in an earlier blog, in less than 24 hours from when I posted that, I got a phone call from GOP State Chairman John Whitbeck, telling me that it is not a defensible statement and could I remove it. I did, not because I agreed with him but because I am and have always tried to be, a team player. That means most all of the people who have cried big, fat, wet crocodile tears about this statement, are themselves the ones who circulated the John Jay quote. Not me. To then pretend how hurt they are about all of this attention to a quote, THEY are the ones, a week later, who circulated it, it is absurd. It is a phony issue they have created. 6. Ran this line of attack by a few friends and they told him not to do it? This is false and it is why the post by the individual was removed. The discussion that I brought up was that our candidate had not once in his opening monologue at any speaking venue given a sentence or two about his faith. I felt it is important to publicly declare your faith, because it is one’s duty to do so. His opponent has openly declared his faith as well as printed on his palm cards where he worshipped. Our group did not want our candidate to do it because they thought somebody may take it the wrong way and our candidate agreed. That is what was ran by our candidate committee. So the idea of make a statement of being Catholic and where he worshipped was dropped. There was no planned attack nor would it have been by simply declaring oneself to God and where one worships. The other candidate does openly declare and it is a good thing that he does which I support that he does. My quote was not an attack and it is before this discussion ever took place. It is false, much like all the other accusations. What John Whitbeck is doing, at the bidding of the blog he admits in his radio interview is merely a constant critic of the Republican Party, is unfair and a misuse of his authority as State Chairman. He has taken my words out of context, made no effort to learn my side, and has launched a campaign in tandem in an unholy alliance of Bearing Drift, Blue Virginia and other liberal-left advocates both within and outside the Republican Party. Why would the Republican Party take the advise of those losers who admit their strategy failed to win in ten consecutive elections? Why would anyone be fooled into thinking that their state central committee meeting to expel me on March 24, is anything but a star chamber proceeding with a pre-ordained outcome? How can it be fair to have John Whitbeck preside over the GOP in this state and especially at this meeting on March 24, when he is already an advocate? Even a rudimentary understanding of Roberts Rules of Order (which barely, I have, not being a law school graduate as my establishment and liberal GOP detractors are) would enable you to know a Chairman who is an advocate instead of acting as an impartial chair, should step aside as chair. John Whitbeck should step aside as GOP State Chairman or at the least, as the person chairing the meeting called to expel me on March 24. The person who chairs the meeting, and those who should vote, ought only to be, those who did not prejudge the matter by signing the petition pronouncing me guilty of something without ever having heard my side. Fantastic article, Fredy! You’ve pointed out the absurdity of the coming kangaroo court. As a lifelong Catholic, I have never been offended by your stances. We have had mutually-respectful religious discussions I’ve enjoyed. I really hope it’s not as bad as you fear, and wiser heads prevail at next Sat (March 24th) meeting. The SCC is woefully out of touch if they don’t realize purging you would destroy the Party! There are a lot of regular Republicans here in Virginia who will be enraged and won’t take your expulsion lightly. This won’t blow over quickly: we’ll publicized the names of cowards who knuckled under to leadership’s threats on a widly-circulated Wall of Shame. Let the world see the worms. And maybe that’s what RPV leadership want after all: to destroy the Party right before the Spring GOP Senatorial primary so the clear front-runner, Corey Stewart is hob-nobbed. Globalists RPV leadership would rather Kaine win over stalwart, Trump-supporter Corey Stewart. 1. If you’re not allowed to hold a differing opinion or question the leadership without fear of reprisal or expulsion, that’s the working definition a cult. 2. How can someone be”anti-semitic” while serving the God of Abraham? And while following the way of a Jewish man? That’s a completely ridiculous accusation that’s false by definition, and sold to spark fear in people while aimed directly at faith in Christ. Add 1 and 2 together and what do you get? A high control group that uses lies and fear to control people while attacking faith in Christ. What good can come of that? Don’t believe the branding, believe the actions. And no, it’s NOT “of nature and nature’s god”, that unfortunately is where it all started to get watered down. It is the aforementioned God of Abraham and Creator of Scripture. Don’t worship the founders, they were good but not infallible men. Its always been about the slow chipping away. I want to thank you for the stand you’ve taken. Mr. Burgos, thank you so much for all of the work that you have done for the Republican Party in Fairfax County. My late husband and I were always looking for you at some of the local Republican meetings and were pleased to see you active. God bless you. In my view, your comments are well written; I in no way believe that you should be removed from your position. You followed the correction that your leader requested. What else does he desire? I am sure that any of the current leaders have had to be corrected and were not removed from this office.